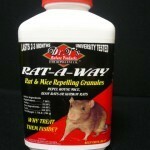 PRODUCT DESCRIPTION: A granular material which is designed to repel rodents from treated areas. It is formulated to withstand rain and last one or two months. Although it has an odor which you may be able to smell when in it's container, once applied you won't know it is there. Safe to use around children and pets. 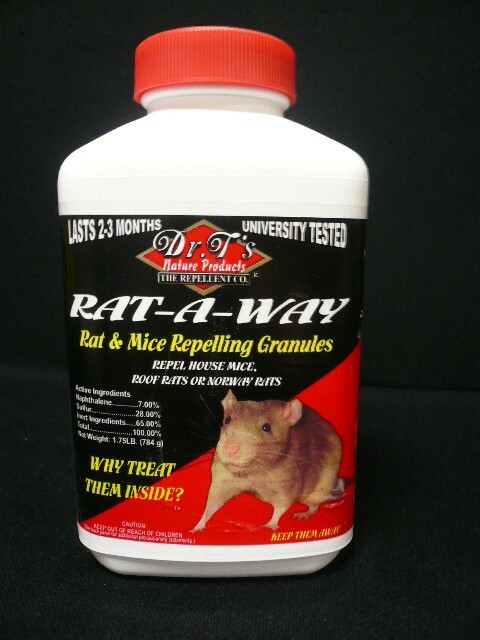 Designed to keep new rodents from coming into the home, but will not get rid of the ones you have. An added feature is that using it seems to reduce scent trails left from previous rodent activity. By reducing these odors by a combination of masking as well as absorbing them, new rodents coming around the area aren't able to determine any established trails. This greatly reduces the chance of re-infestation. WHERE TO USE IT: Around the home and garbage areas or at points of entry such as fence rows, the edge of your yard to a field or stream or around sewer and drainage areas. RATE OF APPLICATION: 1.75 lbs will draw a line about 100 feet long. The larger 4 lb jar is enough to go around the average home or up to 250 linear feet. When using with Granule Guards, place 1/2 lb of Repellent per Guard and make your placements no more than 15 feet apart. It is recommended that your initial application includes the treatment of the turf; subsequent applications can be done in the Granule Guards only with no need to sprinkle any Repellent between Guards.